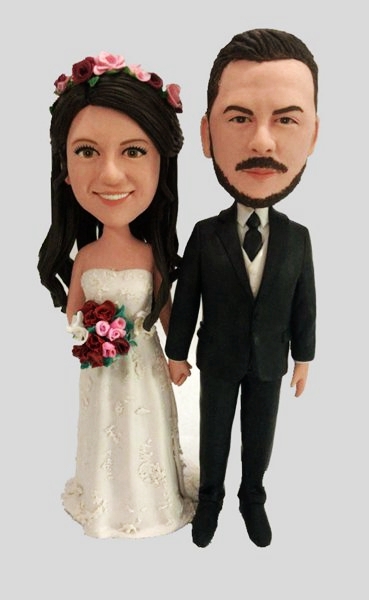 WowBobbleHead- Wow, We Can Make You Into Bobble Heads Dolls! We 100% handmade your custom bobbleheads with Polymer Clay - the color is the clay itself, NO PAINTS on the dolls, so the final product is actually brighter, true 3D likeness and higher quality. WowBobbleHead offer FREE approvals in the different stages during the creation of your hand sculpted bobblehead doll, ensuring max satisfaction. via email with your order number instead. * If you have chosen the option"Clothing - Change Color", please describe your clothes color here. We offer FREE APPROVALS in the different stages during the creation of your hand sculpted custom bobbleheads. During the process, we send head proofs, hair proofs, body proofs and final proofs to your email. Each step can be approved or modified, if a change is requested, we will adjust the doll and provide a new proof - if it is approved we will bake that step and move towards another proof. As approvals are received, we bake and process your bobbleheads, we can not move backwards. The Primary photo is required, at least one clear enough profile photo, please know that- we made from the photo. Please limit the size of each photo you are uploading to less than 1 MB each. If you fail to upload the photos online, just continue the checkout, once complete you can email us the photos. During checkout, our site will allow you to select the time you want the doll received in. Charge is base on the time frame you selected, We use DHL/Fedex/EMS airline express for all order, usually 2-5 days to worldwide since we send it out.